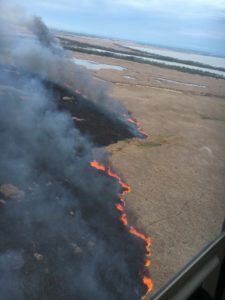 FIRE UPDATE: Monday, May 21, 2018 4:00 PM – The marsh fire flared up again this morning causing substantial smoke. The fire is moving north. No property is at risk. FIRE UPDATE: Thursday, May 17, 2018 4:00 PM – The Province sent out a helicopter to assess the fire north of St. Peters Road this afternoon (see photo below). The good news is that no property owners are at risk as the fire has nowhere to go. It is still being closely monitored and there is rain in the forecast. 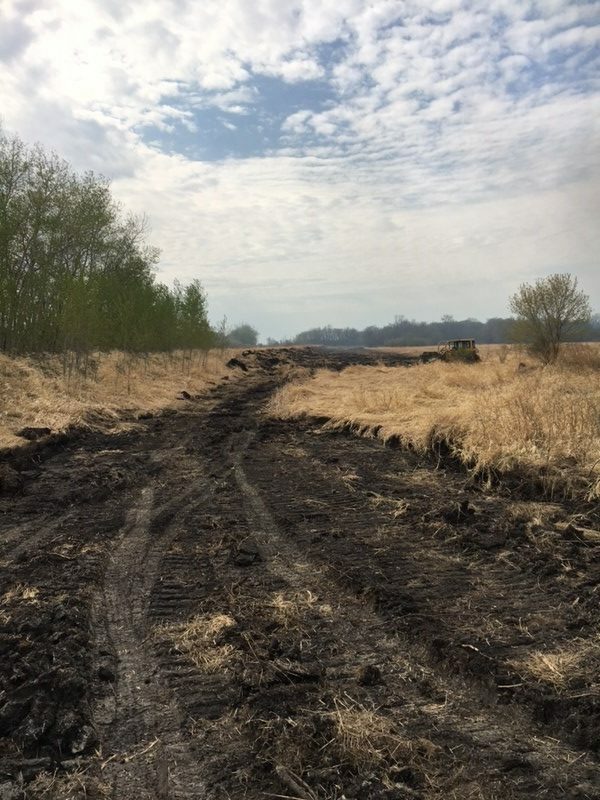 FIRE UPDATE: Thursday, May 17, 2018 10:00 AM – There has been no change with the fire north of St. Peters Road. The fire is considered to be under control and firefighters are continuing to closely monitor. Firefighters are still monitoring the fire north of St. Peters Road. 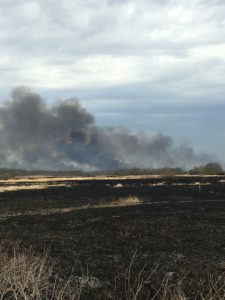 With the assistance of public works, a fire break was created on the south side of the fire between the fire and homes. The fire is smouldering but not moving. Fire near the RM of Alexander border east of Highway 12 and north of 317 is under control, still smoking and being monitored. 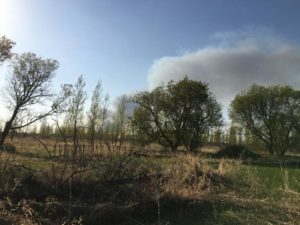 Firefighters have been fighting two fires in the RM of St. Clements this week, one north of St. Peters Road near the marsh and one near the RM of Alexander border east of Highway 12 and north of 317. The East Selkirk Fire Department has been fighting a grass fire north on St Peters Road. It was out on Monday, May 14 but restarted yesterday. The area is about 200 hectares. ESFD, with assistance from Narol, Scantebury and East Beaches Fire Departments, worked on the fire from 2:30 pm to 10:30 pm on Tuesday, May 15. The fire crossed the road where Road 85 meets St. Peters Road. Winds from the north are pushing the fire south. This is causing substantial smoke in the Peltz Drive area. The wind slowed down the night of Tuesday, May 16. the Office of the Fire Commissioner has been on site. The provincial Emergency Measures Office has offered assistance. East Selkirk Fire Department Chief Kevin Zacharkiw, is cautious but optimistic that the fire will not get out of control. East Beaches Fire Department has been working on a peat moss fire for about a week, north of Greenwald Colony. This is causing some smoke. 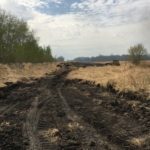 Peat fires are difficult to extinguish as they burn underground. People have been fighting the fire all week, including ten provincial employees.